In point of fact it was disconcerting how small the package was - that box is about 5" on a side. I hadn't purchased a Kabuki model in something like five years, as the 'Angron' model I'd purchased ended up being barely space marine sized, let alone suitable as a primarch stand-in and I was supremely disappointed in it. The measurements on the website suggested these models should be more appropriately scaled so I figured I'd roll the dice (and take advantage of a sale they were running). 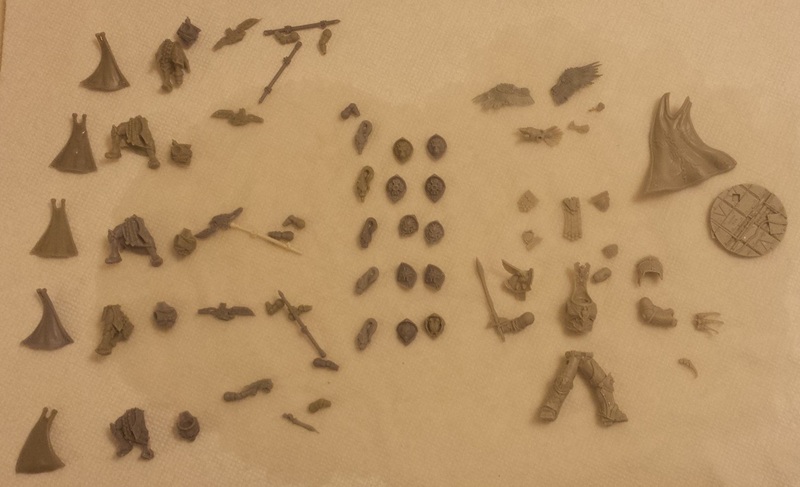 With some trepidation I cracked open the box and was relieved to find that the models were sized far more appropriately and so bustled everything in for a soak and scrub. The models were virtually free of flash, though were several different colors of resin which isn't a dealbreaker but does give off that 'garage kit' vibe and makes me worry somewhat about quality control. That said, everything appeared to be crisply cast and there were almost no bubbles to worry about filling in. 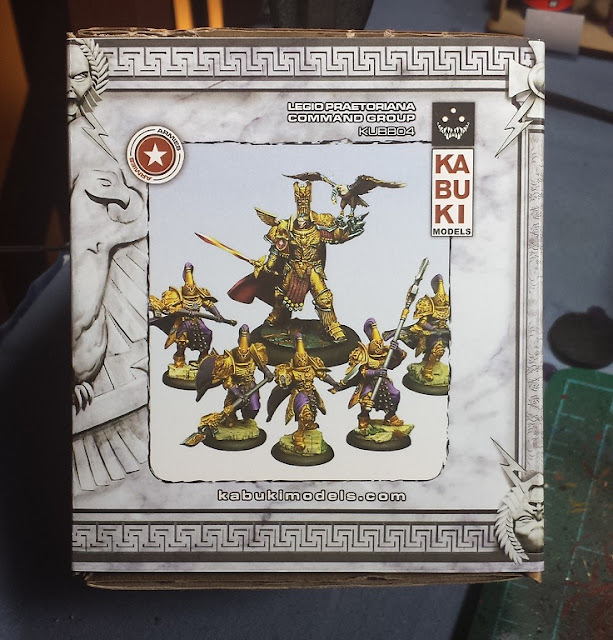 I'm somewhat ambivalent about the Custodes sculpts (they're neat but I'm holding out for the Forge World models which ought to be spectacular), but as it's been mentioned a few times that FW doesn't intend to do models or rules for the Emperor any time in the foreseeable future, I thought the Kabuki version of the model would be a fun little art project, and give me a large-scale model to try and really lavish some attention on. The model comes with a two-headed cyber-eagle that I'm saving for another project, which allowed me to alter the pose somewhat. 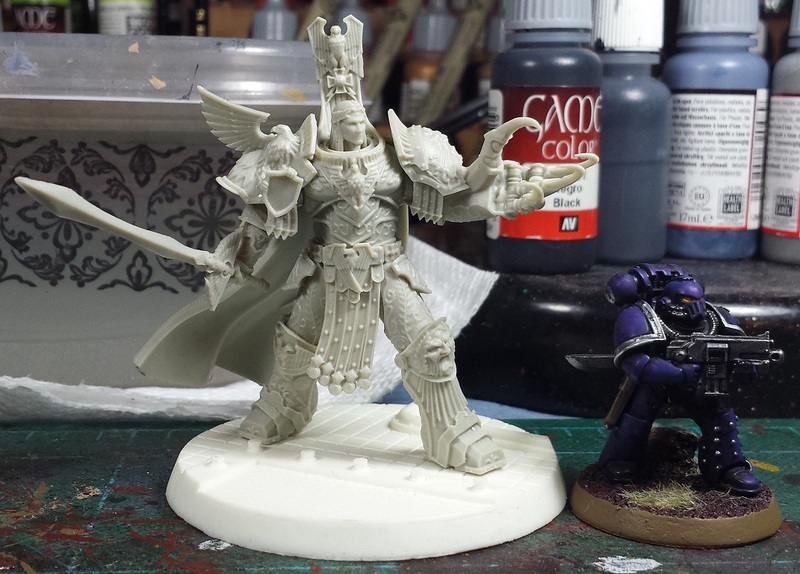 I don't have a primarch model on hand to compare sizes with, but he does seem to stand about a head taller than the ones that I've done in the past. Large enough to warrant a 60mm base at the very least, and towering over the alpha legionnaire! I'm going to have to do a lot of research on painting gold before I ever put a brush to this model. Definitely want to do it justice, and really push myself to get beyond the "decent tabletop quality" I usually accomplish. Should be fun! Really stunning model there, and one that I have thought about getting myself. I agree with your assessment of the Custodes, they're not quite there, and I expect the FW team to do mind blowing work. One thing I don't like is the head, it seems way too small! Look forward to seeing you throw some paint at it mate. Never been much of a fan of the Kabuki stuff. Style seems almost there, but just missing the mark, and the scale disparity didn't help either. 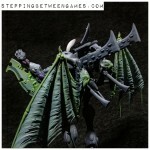 But the Emp' looks rather impressive from here and I'm sure you'll do a great job making him look the part. @Sheep: Indeed, the head does seem a little elfin for the model, would have preferred a more heavy-browed stern looking head. Other than that I'm pretty pleased with it. It's no FW quality, but it's nice nonetheless. The custodes will likely end up on the auction block or just chucked in a box to lurk in the Closet of Doom for a rainy day. @NafNaf: I'm not the biggest fan of Kabuki overall, but this model started to turn my opinion around. Should be fun to paint! I find it interesting that the "Emperor" model, as such, is so massive. It's the Primarchs that are massive, the Emperor is a "normal" man, albeit an Immortal and a genius psyker. I was just going to posy what Faolan said. Great looking model though. Sure you will do him justice. It certainly is a finely detailed model. I bought a Kabuki Roboute Guilliman a few years back, and ended up swapping in plastic GW-made head. While not huge (wow, that Emperor is twice the size of an Astartes...) it still looks alright next to the rest of my SM's. Can't wait to see him painted! @Alpha Omega: Indeed - I've heard that FW may not be doing one, or if they do it's so far off in the future when they finally do the Siege of Terra. I'm planning on working in some various areas of silver and bronze to help give it more depth. Worst case scenario, it ends up being a big bronze statue as a piece of terrain. Hah! @#2501: Indeed, the head is just a little thin, we'll see how it looks painted up I suppose! @Zzzzzz: After all the gold he'll get, shiny is probably gonna be the perfect adjective. Hah! Looking forward to seeing what you do with him anyway. I second all of the above! What colour scheme are you intending on using? You planning on following the artwork?